Join us to see how you can combine the power of Tableau with the MarkLogic Enterprise NoSQL database to perform analytics against disparate data sets composed of structured, unstructured and graph data. The result is an unprecedented level of flexibility and power from being able to correlate and analyze “Big Ugly Data” in its natural form. How combining the two tool sets of Tableau and MarkLogic capabilities which will allow you to rapidly performing real-time, advanced analytics to extract insights from unstructured information. What is the difference between KPI, metric, and measure? A Measure is generally a single quantitative value or field that is generated at a low level and then summarized for analysis. Examples might be “Sales Amount” or “Pieces Scrapped”. Metric and Measure are often used interchangably but I think of a Metric as a value that is used to measure success or failure. Therefore a Measure may also be a Metric or a Metric may be calculated from one or more Measures. Think “Gross Profit” or “Scrap Rate”. A KPI or Key Performance Indicator is usually expressed as a metric (or measure) compared to a target value. It may also include a status or trend indicator. An example would be Year to Date sales compared to Plan or Scrap Rate compared to Prior Period Scrap Rate. There are so many NoSQL systems these days that it’s hard to get a quick overview of the major trade-offs involved when evaluating relational and non-relational systems in non-single-server environments. I’ve developed this visual primer with quite a lot of help (see credits at the end), and it’s still a work in progress, so let me know if you see anything misplaced or missing, and I’ll fix it. Without further ado, here’s what you came here for (and further explanation after the visual). Relational systems are the databases we’ve been using for a while now. RDBMSs and systems that support ACIDity and joins are considered relational. Document-oriented systems store structured “documents” such as JSON or XML but have no joins (joins must be handled within your application). It’s very easy to map data from object-oriented software to these systems. If you’re a developer and looking for a job or if you’re hiring developers and these data systems are important to you, consider coming to Hirelite: Speed Dating for the Hiring Process on Tuesday. 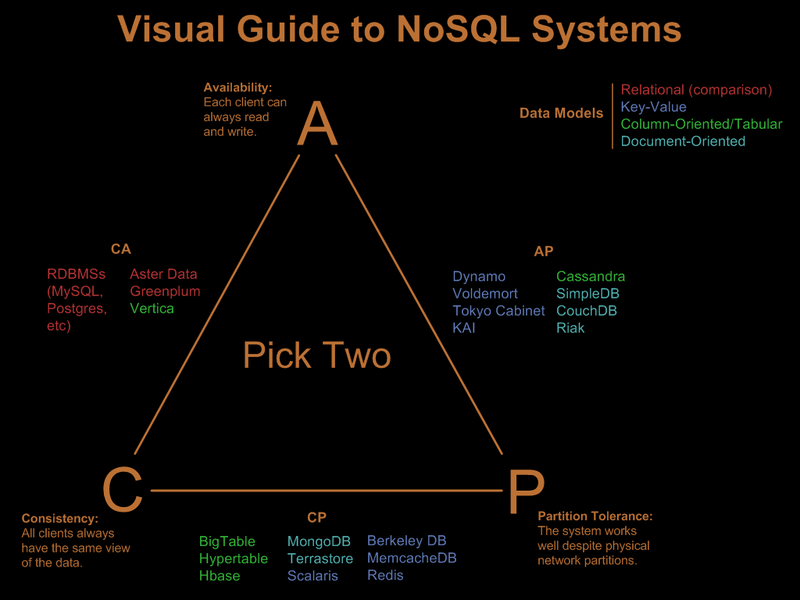 Update: Here’s a print version of the Visual Guide To NoSQL Systems if you need one quickly (warning: it’s not all that pretty and I may not keep it updated, but as of 3/17/2010, it’s current). In NewVantage’s 2012 big data survey of high-level executives and enterprise tech decision makers, a handful of firms forecasted spending more than $100 million over the next three years on big data plans. There is already a subset of firms clearly distinguishing themselves by taking strong steps to establish big data environments that run alongside and are linked to core production environments. These firms are undertaking activities such as analytical sandboxes, big data labs, and the migration of certain applications and queries to Hadoop environments. These firms will learn quickly and will outpace companies who are still considering their big data platform strategies. May 24, 2013 – Working under the weight of sluggish adoption rates, business intelligence is gravitating toward more users and access through a mixed bag of new and old solutions, according to the latest annual BI survey from Dresner Advisory Services. The “2013 Wisdom of Crowds Business Intelligence Market Study” assessed questions of 1,182 respondents across industry verticals and covering fellow researchers, enterprise IT leaders, business executives, BICC heads and vendors’ customer communities. Fifty-nine percent of respondents in 2013 came from North America, and 25 percent stemmed from Europe, the Middle East and Africa, with the rest originating in the Asia/Pacific region or Latin America. Penetration rates for BI are about flat from last year, according to the survey and Howard Dresner, the chief research officer at the research and advisory firm. Approximately one-third of businesses reported that BI solutions were in use by less than 10 percent of employees, according to the survey. And approximately half of those surveyed for that same question reported that BI use dipped even lower. Conversely, another 18 percent of respondents stated that BI solutions were in regular use across four-fifths or more of their organization. Success rates, too, are stagnant from last year’s survey: approximately 40 percent “completely agree” their BI implementation has been a success, with about that same amount who “somewhat agree” on its success. Dresner says penetration levels are no doubt subject to ongoing business pains ranging from business cultural bureaucracy and IT spending limits, to expanding governance and compliance. However, Dresner says that, even flat, penetration levels are encouraging compared with developing BI maturity and the scope of users from the top level executives on down. In addition, there are vast plans to expand the reach of BI: Over the next 36 months, more than 70 percent businesses surveyed intend to increase the number of users and access to BI by 41 percent from their current ranks, according to the survey. The tools and trends that businesses are opting for have proven to be a mixed bag of hot tech solutions and sometimes maligned standbys. Dashboards were the leading BI initiative from those surveyed, more than 80 percent of which labeled BI dashboards as “critical” or “very important.” Other leading BI plans were end-user self-service (70 percent labeled it as “critical” or “very important”) and advanced visualization (60 percent under the same two choices). Small but increasingly greatly from last year were respondents moving to the cloud or as-a-service outlets, which 15 percent of those surveyed called “critical” to their BI plans. In a new area tracked in the survey, embedded applications within BI was in use by nearly 20 percent, which was a surprise to Dresner and will be the subject of a follow-up report later this year. When it comes to business intelligence functions, the hype around big data has yet to really take hold, according to Dresner. The “panacea effect” being pushed by some vendors and forward-thinking analysts isn’t trickling through – and may not any time soon – when it comes to big data, with nearly 30 percent of those surveyed calling big data “not important” to their BI practices. Also cooling is the trend around data warehousing, which was at one point in lock-step with BI. Dresner says warehousing is firmly implanted at large enterprises, but carries enough cost and complexity for smaller and mid-sized businesses that they’re being sidestepped with emerging database software and on-demand platforms. The choices of solutions give insight into where businesses are finding the most value and reach with BI plans, according to Dresner. Two decades after Dresner and others discussed “information democracy” as the means to general access to BI, “that’s not where we’re at.” But the solutions and trends rising in use – or falling by the wayside – are part of the evolution in what Dresner has termed the “renaissance of BI,” a step-by-step process that proves to be casting a wider net of users and more often driven in part with executive buy in. The number of respondents represented a 40 percent increase in from last year’s survey. For more information on the 106-page report, visit here. Justin Kern is senior editor at Information Management and can be reached at justin.kern@sourcemedia.com. Follow him on Twitter at @IMJustinKern. A familiar face at conference events and in analytic writings, Wayne Eckerson returns with 20 chapters that could stand alone as essays but come together as a methodology for solid analytic practices. Eckerson talks with analyst peers and practitioners, like Nokia Senior Director of Big Data Amy O’Connor, who writes: “The way that we’ll succeed at Nokia is to create a culture that treats data as our most critical asset. The keys to making this happen are executive support, evangelism, and collaboration. Following on his previous big seller, “Visualize This,” Nathan Yau brings nice, modern touch to visualization, the vital but often hard-to-pin-down aspect of business data. Yau uses his expertise as a stats Ph.D. from UCLA to back up refined views on data graphics.